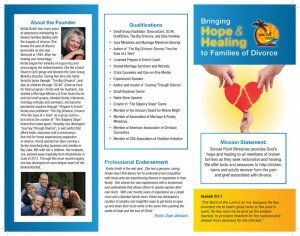 Full access to The Journey Through Divorce web portal. A variety of relevant and helpful articles and activities to assist you in your journey. New articles and activities weekly. An annual subscription to the monthly E-magazine which will be full of challenging stories and encouraging words that apply to your every day life. Periodic audio clips designed to encourage and prepare you for situations you may face along the way. Being a part of an ongoing discussion forum with others who are experiencing the exact same things as you. This will be a place where you have the freedom to ask questions or share personal struggles you encounter on your journey towards hope and healing. It will also give yourself and others the opportunity to personally encourage others along the same path that you are traveling. Being able to be connected with other divorce and single family experts from around the United States that are filled with ample information to share with you. Weekly encouraging words, phrases, questions, challenges and encouragement sent directly to your email. Periodic webinars to equip you to handle situations that may arise (etc. custody issues, dealing with the ex, children’s needs, communication techniques, dealing with losses, understanding where God fits into all this, single parent issues, spiritual struggles). Periodic conference calls where you can personally interact and ask questions of Krista and other leaders. The access to a unique forum called Teen Talk, which will connect you with a young adult who has recently experienced what your children are going through. This is a great forum to ask questions and try to better understand your child.